NFF 2018: What LGBTQIA Movies Can You Watch? I am really excited about this week’s blog post and video. For the past few months, when talking about queer representation in media, I have mostly addressed shows and movies from the US and Canada (and Brazil, hey RED ). This week, I finally get to talk about productions from my own country, the Netherlands. 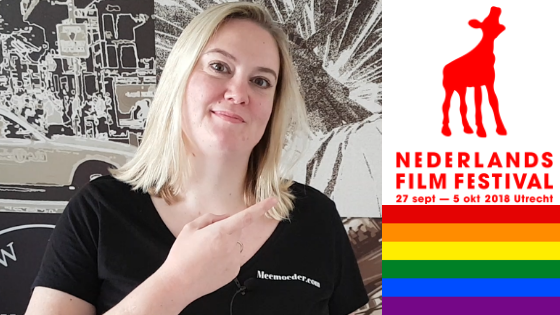 The Nederlands Film Festival (NFF – Dutch Film Festival, the link leads to English program) has sent me a list of LGBTQIA productions that will be shown at NFF 2018, which is held September 27 to October 5. I will discuss my favorite ones in this blog post and in the video below this image. Most of these have English subtitles so you can enjoy them too! The Dutch version of this blog post can be found here. From that impressive list, I have picked the movies that I would want to watch myself as a visitor to the festival after watching the trailers and reading their synopsis. That means not every LGBT production available at the NFF will be described in this blog post and the video below. I have contacted the production companies of the movies that I have picked for a preview and so I am able to give you my opinion about those and help you decide which ones you want to see. One production, which I have been anticipating for a long time now, was not able to give me a preview but their material will be available this Sunday. That means I will be able to dedicate a single blog post and video to Anne+ next week. I first want to talk about Taxi Stories. Before watching this movie, I was the least fascinated by this production because I did not know how it could be interesting. I knew there would be three stories in one movie, all revolving around a taxi ride. I knew class differences would be highlighted and that there would be some LGBT elements. Nevertheless, this movie was the biggest surprise for me. The movie takes place in three different Asian cities: Beijing, Hong Kong, and Jakarta. I am immediately drawn to the colors and the people. I want to know the backstories of the main characters and I am constantly wondering where the stories are going. At some moments, I feel disgusted and at other moments, I feel intrigued. The cultural differences are interesting and the scenery is beautiful. There were much more LGBT elements than I expected too. Let me tell you, though, this movie does not make us people look good! We are a pretty disappointing bunch. Yes, you will definitely have feelings after watching this movie. You need to know about ballroom dancing before watching Mother’s Balls. If this is your first introduction, your questions are left unanswered for a long time, which distracts from the real story. The real story is Amber’s efforts to have The Netherlands and Belgium get to know ballroom dancing. She puts so much time, effort, money, and love into it. The ballroom scene also means being a family and that really comes to the forefront. I could really relate to the ending, where Amber starts talking about her family. She does not want to cry but she does. You just feel for her. As a kid, you simply want to be loved by your parents. It is amazing to see how she finds that family love in her ballroom family and gives that feeling back to others. I am happy they did not just show the confident performer Amber. If they had not shown vulnerable Amber, I would never think the ballroom scene would be something I could possibly belong to; this part makes the ballroom scene look more accessible and relatable. The documentary has beautiful close-ups and nice breaks from the colorful, loud scene to small dances, like the one with a white background and a man in black dancing and moving merely with his hands. Those 48 minutes flew by. His story ends when he arrives in Rotterdam. Up to that point, we see him dancing in contests (where Amber is present), we see him all by himself, and we see him together with his mom. Most of this is shown in slow motion so you can really listen to his story and still get a glimpse of his dancing. This documentary offers many close-ups and artistically shot poses and dance moves to support the story. I really want to hear what happened after he arrived in Rotterdam, how he felt, and how he ended up with the House of Vineyard. So, the documentary drew me in; I felt it. NFF shows Otherland before Mother’s Balls but I prefer watching the movies the other way around. Still, I get why they have chosen to put a short film before a longer film. I really liked Dòst. The setting of this movie felt really familiar to me. I grew up in a village in the countryside and this movie focuses on two teenage boys working together on the land, cutting asparagus. It is all very relatable, how awkward the guys and girls are with their first kiss. I sometimes even felt embarrassed for them. Things change halfway the movie. You have come on a journey with the main character but now, you start to dislike him. You feel bad for him but you feel bad for the other character ten times more. The peer pressure in this group of guys is real. After watching the movie, I really wondered how the story continued and what happened to the two characters, apart from each other but also together. It pulls you in, thanks to the beautiful close-ups and the perfectly cast actors. Stille Dorst highlights the moment Tarik rents a holiday home from Jonas to process his divorce. This short film offers few lines and many moments of silences. As a result, you are really focused on what Tarik is seeing and you are constantly wondering what he is thinking. His inner struggles are clearly visible, which is powerful. However, even though the movie is only twenty-two minutes long, it still feels long to me. I think it feels this way because it focuses on details so much and offers so many silent moments. One moment I like in particular is when the two main characters go outside to find some peace and quiet. You can clearly hear the sounds of nature, which almost made me feel zen at home. Wognum took me by surprise. This short documentary is very special because you see two completely different worlds and only one main character. Matthijs is forty-two years old and still frequents the rave world. In the first few minutes, you feel his loneliness, which is painful. At big, crowded parties, he does not seem to connect with anyone. You learn that he has a boyfriend but at home, things are not going great. It seems as if he has money that he feels that people use him for that. He has a big collection of model trains in the attic, with which he plays. He invites others to play with them as well. You can tell this is where he feels safe. Then, you discover another side of Matthijs. You wonder what a man like him is doing in a piano store but when he starts playing, you know why. It is lovely to watch him play. The ending is very emotional and heartwarming. It is beautiful to see when a person is finally recognized for one’s talents. It obviously has not happened a lot to him. Vlam is a very short production of only sixteen minutes but you see quite a lot. This short film revolves around a camping trip with two friends, who meet three French guys. The first thing you notice is the colors of this movie. There are a lot of neon colors and bright pink, which make the story a bit absurd. Since they smoke weed at a certain point, you are almost looking at everything in a haze. The story is very relatable too. I am sure you can remember the jealousy when someone you liked made out with someone else right in front of you. You can probably also remember some stupid things you did after that. Also, the ending left me wondering what happened next. I really wanted this short film to last longer! Yulia & Juliet is a brilliant short film. Yulia and Juliet are in love with each other but they are in a juvenile detention center. We know TV shows with lesbian relationships in institutions: Orange is the new black and Wentworth. Now we have Yulia & Juliet too. You can truly feel the sense of confinement. They speak to each other through the ventilation system, they whistle to let the other person know they are there, and they find short moments together. This movie knows how to use the main elements of Shakespeare’s Romeo & Juliet in a very short amount of time and it is great to see this version of the classic. Dante vs. Mohammed Ali is an absurd and entertaining short film. Most of the time, you are wondering what the setting is. The way Wolf talks (and he calls himself Dante) makes you wonder whether you are watching a movie set in medieval times; or, is it a play turned into a movie? But then the clothes remind me of the 80s/90s. Also, where in the world is everyone so occupied with a weekly boxing match on a boat? In a way, this movie raises a lot of questions that it never answers. You do not really mind though. What you are here for is the love story and yes, that guides you through all the weirdness. I would not recommend Niemand in de stad as an LGBT movie to watch. In fact, it falls victim to the Bury Your Gays trope, about which you can read here, here, and here, so if you are looking for positive queer representation, this movie is not for you. That said, if you are okay with that and you want to look for (straight) beauty elsewhere in the movie, Niemand in de stad is a good choice. The movie has likable actors, it has its funny moments (I mean, the beginning nearly had me vomiting while still making me laugh), and it makes you go on a journey with the main character. You do not always like him or his actions but you do understand how he is trying to figure everything out growing up. Plus, I always love seeing Amsterdam frat boys make themselves look like idiots. :p Consequently, despite the lack of positive queer representation, I am happy I watched this movie so I still want to add it to my list. Other LGBT movies that you can watch are At Midnight Plays a Dance-Tune, Error of Eros, and A Double Life.